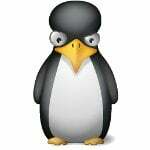 Kernel-based Virtual Machine (KVM) is a virtualization module for the Linux kernel that turns it into a hypervisor. 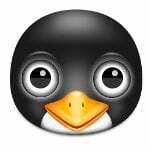 How can I install KVM, setup guest operating system as the back-end virtualization technology for non-graphic Ubuntu Linux 14.04 LTS server? You can use KVM to run multiple operating systems such as Windows, *BSD, Linux distro using virtual machines. Each virtual machine has its private disk, graphics card, a network card and more. 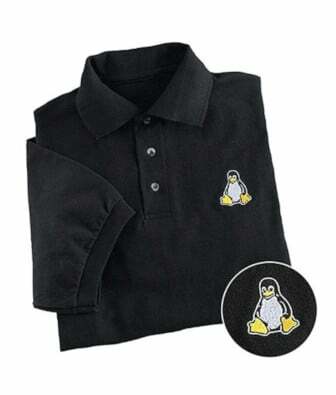 KVM is a hypervisor that creates and run virtual machines. A server on which a hypervisor is running is called as a host machine. Each virtual machine is referred to as a guest machine. 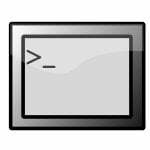 Using KVM, you can run multiple operating systems such as CentOS, OpenBSD, FreeBSD, MS-Windows running unmodified. Fig.01: What is KVM hypervisor? The host server located in the remote data center and it is a headless server. All commands in this tutorial typed over the ssh based session. You need a vnc client to install the guest operating system. 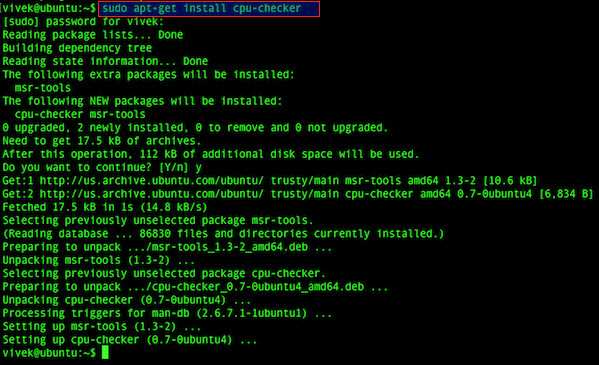 In this tutorial, you will learn how to install KVM software on Ubuntu and use KVM to setup your first guest VM. Starting install... Allocating 'centos7.img' | 20 GB 00:00 Creating domain... | 0 B 00:00 WARNING Unable to connect to graphical console: virt-viewer not installed. Please install the 'virt-viewer' package. Domain installation still in progress. You can reconnect to the console to complete the installation process. --virt-type=kvm : Use kvm as the hypervisor to install CentOS7 guest. 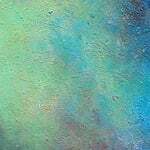 --name centos7 : Name of the new guest virtual machine instance. --ram 1024 : Memory to allocate for guest instance in megabytes. --vcpus=1 : Number of virtual cpus to configure for the guest. 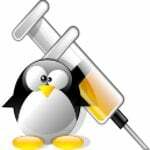 --os-variant=rhel7 : Optimize the guest configuration for a specific operating system variant. Use ‘virt-install --os-variant list‘ to see the full OS list. --hvm : Request the use of full virtualization. --cdrom=/var/lib/libvirt/boot/CentOS-7-x86_64-Minimal-1511.iso : File or device use as a virtual CD-ROM device for fully virtualized guests. 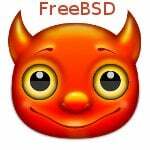 It can be path to an ISO image, or to a CDROM device. --network network=default,model=virtio : Connect the guest to the host network. In this example, connect to a virtual network in the host called “default” with nic model called virtio. --graphics vnc : Setup a virtual console in the guest and export it as a VNC server in the host. This is useful for our headless server (see below). --disk path=/var/lib/libvirt/images/centos7.img,size=20,bus=virtio : Specifies media to use as storage for the guest. 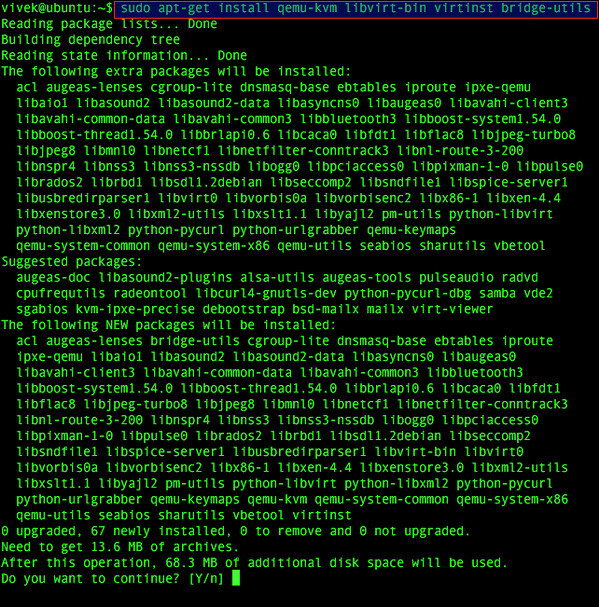 A path to /var/lib/libvirt/images/centos7.img storage media to use with size (20 GB) to use if creating new storage and disk bus type set to virtio. Please note down the port value (i.e. 5901). 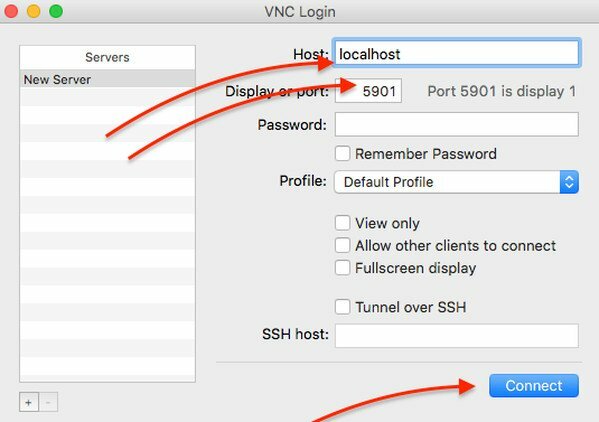 You need to use an SSH client to setup tunnel and a VNC client to access the remote vnc server. ssh vivek@server1.cyberciti.biz – Establishes the SSH session to the remote KVM host at server1.cyberciti.biz host. -L – Start local port forwarding. 5901:127.0.0.1:5901 – Setup tunnel i.e. pass traffic over the internet to access remote server 127.0.0.1 and port 5901. 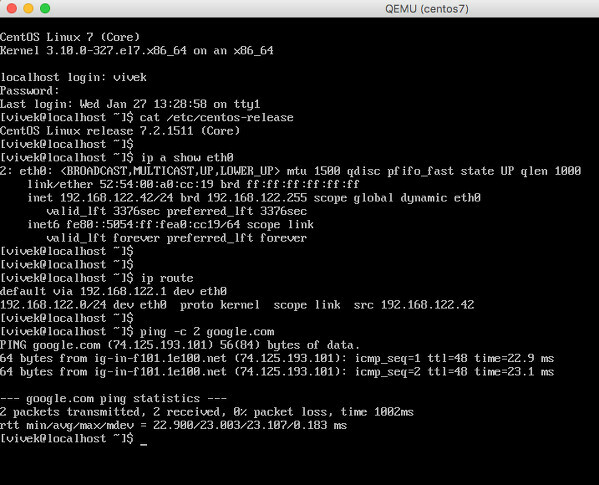 See “Setup SSH To Tunnel VNC Traffic Though Internet” for more information. And, there you have it a CentOS 7 vm running KVM on top of the Ubuntu Linux 14.04 LTS server. 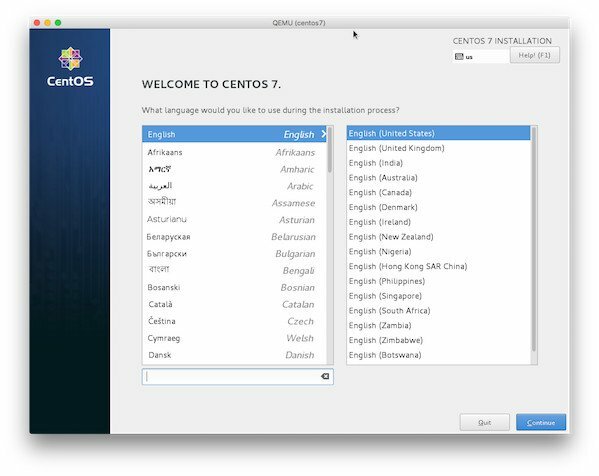 In the default configuration, the CentOS 7 guest operating system will have access to network services, but will not be visible to other machines on the network or from the Internets. The CentOS VM will not be able to host an accessible web server. In next part of this tutorial I will talk about port forwarding and setting up bridged networking to connect to the outside network transparently. I’m not an admin, but I needed to understand what kind of complexity is involved in this. I appreciate you effort! I’d like to run Elementary OS on Intel HD graphics (OK it’s working), but add second card (ATI Radeon) via KVM to Windows VM (no as graphic memory, but as phisical video card). Is there any possobility to run this like I want? Iâ€™m not an admin, but I needed to understand what kind of complexity is involved in this. I appreciate you effort! As explained Impressively, well explained, that we the noobs, we can understand it. Domain installation does not appear to have been successful. otherwise, please restart your installation. what do i need to do if I am going to run the vnc client from a Windows desktop? Yeah, I am stuck on the same thing. If you have to initiate the VNC session in order to complete the CentOS installation, how is it that you already have given it a hostname (server1) as well as added a user account (vivek)? This will begin the ssh tunnel so you can move to the next step. I think the author intended on this being the case, but it took some interpretation. Excellent article however I don;t see the network bridge addressed. You would need that for the VMs to communicate with in the network correct?